"How many mums have shed a million tears because of their son getting stabbed?" Abdi - whose surname we are not using - has previously served three years in prison for selling Class A drugs.While there, he was supported by Key4Life - a charity set up after the 2011 riots with the aim of reducing youth reoffending.He says the charity's role was crucial in helping him change. "They kept on visiting me in prison, that was a strong thing for me," he says. "Someone I don't know taking their own time, voluntarily coming out of their own way to help me - I thought to myself, 'Wow, these people are good people. '"I said, 'I'm gonna cut off all the bad people in my life. '"But, as a stark reminder of how difficult it can be to leave gang life behind, Abdi was attacked shortly after leaving prison. "I was walking on the High Street late at night, coming from my friend's house, and a car pulled up," he says. "Three black boys jumped out on me and stabbed me. "There was a gash, long gash. "Abdi went to hospital, but admits he fled at the first mention of medical staff contacting police. "I just knew I had to leave, because I know people that have been recalled to prison by being attacked," he says. "I used to roll with knives," admits "Creeper" - a 23-year-old rapper from Birmingham. "But when my friend got killed, I thought, 'Do I really want to carry a knife? '"If you roll with a knife you might think, 'Nah, I'm not going to use it, I might just scare someone'… [but] me personally, when I get angry I can't control what I'm going to do. "So I'm thinking, 'If I don't roll with a knife, there's no chance I can stab someone. "Creeper has been supported by Key4Life since 2013.The charity's rehabilitation programme focuses on employment, mentorship and emotional and behavioural change.As part of this, it has begun taking young men aged 18 to 26, who are in prison or at risk of going to prison, to a retreat in Somerset to help them understand how their behaviour affects others, as well as helping them realise how to change it. Abdi remembers one activity that involved using horses to teach them how to control their emotions and interact with new experiences - first by approaching the horse, and then learning to ride it. "It was nerve-racking because I'd never been on a horse before," Abdi recalls. "The only horses we knew were [the ones when] the police were in the estate. So every time I saw horses it was a red flag for me. "Abdi says he has taken the memory of the riding with him, and uses the tools he learned through it in everyday life. "When I meet new people I practise how I approach them, how I communicate with them. It's all about interacting with people - the emotion, the feelings," he explains.Another activity sees the young men write on a sheet of paper what is stopping their progress, and holding them back in life, before throwing it on a bonfire. "It was good for me personally, because I know what I wrote. I wrote, 'Prison,'" Abdi says. "And when I wrote that down I promised myself, 'I'm not going behind no steel door again'"But there are many reasons why violence can flare up.One that frequently arose during discussions on gang culture at the retreat, with Abdi and Creeper among others, was drill music - a form of rap music emanating from Chicago with highly aggressive lyrics. "Most of it is talking about stabbing people, shooting people," says Creeper. "A lot of young people listen to it, 13-year-olds, 14-year-olds. "So they're looking up to these rappers, thinking, 'Yeah, I like this rapper, let me roll with a knife then. 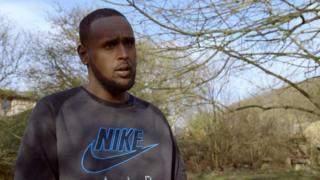 '"Since the retreat in early March, where nine men were trying to turn their lives around, a number have been stabbed or threatened - again illustrating the difficulties in finding a life away from violence.Abdi has a blunt message for anyone at risk of being sucked into a gang. "Don't get caught up in this lifestyle... trust me," he says.Watch the BBC's Victoria Derbyshire programme on weekdays between 09:00 and 11:00 on BBC Two and the BBC News Channel.